IMBOLC Imbolc was the pre-Christian, Celtic festival associated with the Spring season. The date it was celebrated on was the exact midpoint between the Winter solstice and the Spring equinox, what is called a cross quarter day. Of course, here in Calgary, the answer is NO, spring has not yet sprung. There is snow and Ice everywhere, the current temperature is -7C and feels like - 15C. I dont know why always go to the trouble to say the current temp and then the windchill temp... both are cold, do we need to accentuate it? Anyway, cold winter weather is perfect for KNITTING, and also, Celebrating the HOPE that spring is coming. Maybe that is what the saying Hope Springs Eternal is all about ;) Knitting is what I am all about at the moment, with quite a long list of works in progress. Today is a good day to work on the sweater I call Gwen. There is not much to see yet, just several rows with plenty of pretty cables running in twisty little lines up from the bottom. The pattern calls it a jacket. I call her a sweater. 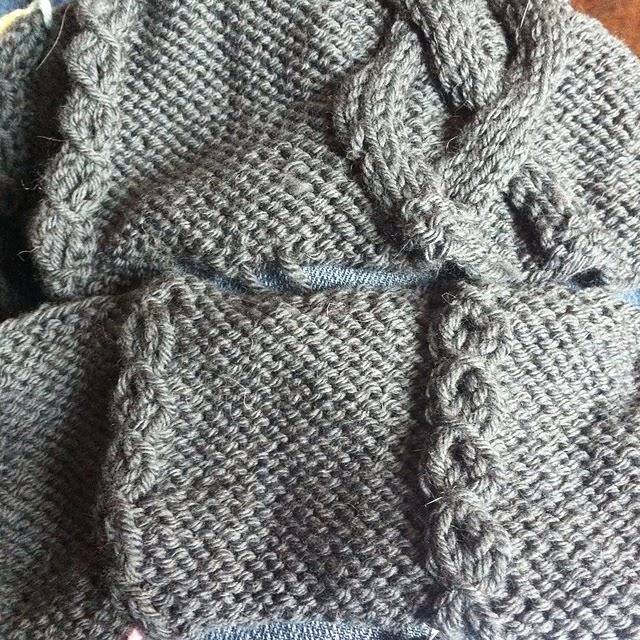 I bought the soft grey yarn last year, for something else, but, by the time I wanted to knit, my plans had changed. This happens often to me, and I don't really mind. Awen, creativity, comes when it wants, and how it wants. And, I am okay with that!